Just an hour from Awakeri Hot Springs’ Holiday Park, Rotorua is a great place to spend an action-packed day during your Awakeri camping holiday. 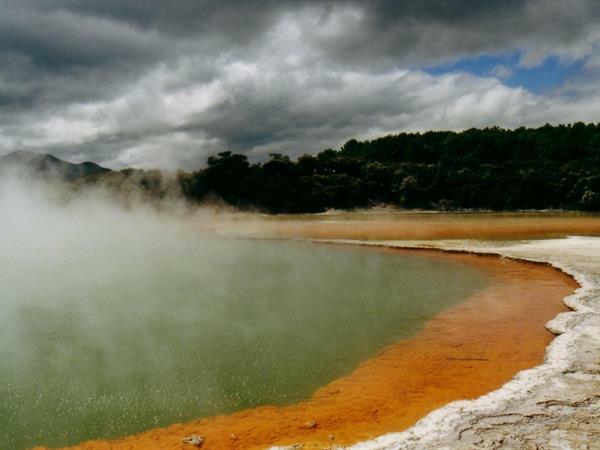 Rotorua is famous for its thermal wonders! See bubbling mud pools, sulphuric vents and natural geysers. Immerse yourself in the traditional world of the Maori by visiting a Maori cultural village. Experience the Powhiri (traditional welcome), dine on a sumptuous Hangi (meat and produce cooked in an earth oven) and enjoy the passion and power of Maori song and dance. Rotorua is teeming with iconic Bay of Plenty attractions and things to do. Rotorua’s lakefront is a great place to enjoy beautiful vistas, take out a paddle boat for some fun or enjoy the weekend craft market. Click here to read more about art and crafts in the Bay of Plenty. Enjoy superb views with a Gondola ride up Rotorua’s Mount Ngongotaha, then whiz back down the mountain in an exhilarating Luge, on specially designed speed tracks! After an action packed day, rest your achy joints in our Awakeri Hot Pools – the perfect end to a perfect day!